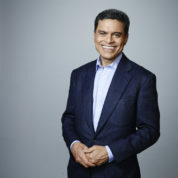 Fareed Zakaria GPS, CNN’s flagship international affairs program, has become a destination for those seeking smart commentary and civil conversation about the big ideas and global challenges of our time. Winner of the prestigious 2012 Peabody Award, GPS features Zakaria’s commentary, panel discussions and one-on-one interviews with heads of state, intellectuals, and business leaders. His Washington Post columns and covers stories — ranging from the future of the Middle East and America’s role in the world to the politics and culture of the global economy — reach tens of millions of readers. Zakaria has written two international bestsellers, The Future of Freedom, and The Post-American World. Both have been translated into more than 25 languages. His latest book, In Defense of a Liberal Education, debuted at #6 on The New York Times best sellers list in April 2015. Born in India and educated at Yale and Harvard, where he received his PhD. Zakaria became managing editor of Foreign Affairs at 28. He was the editor of Newsweek International from 2000 to 2010 and Editor-at-Large at TIME from 2010 to 2014. Zakaria has won many awards, including a National Magazine Award for his columns. He received one of India’s highest civilian honors, the Padma Bhushan. He has received honorary degrees from Harvard, Brown, Johns Hopkins, the University of Miami and Oberlin College, among others.